Flyduino has been in the multirotor business since the very beginning when MultiWii quads were the leading edge. Later they introduced their KISS program. KISS stands for „keep it super simple“ and is dedicated to all the people, who are more into flying than tuning PIDs. The newest addition is a newly developed flight controller, which competes against the well established boards like Naze Rev.6 or SPR F3. 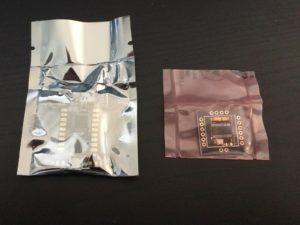 This review looks a little closer at the Flyduino KISS FC and what it is able to do. Well, the box in this case is as silver anti-static bag. And in this bag you’ll find exactly one thing: the rather tiny KISS FC board. Let’s have a look at the technical specs first. The KISS FC also provides support for multiple analog and digital receiver protocols. These are PPM, Spektrum Sat (Serial), SBUS, Jeti ExBus, Graupner SumD / SUmO, MultiPlex and PWM with every channel connected separately (for the old school guys). 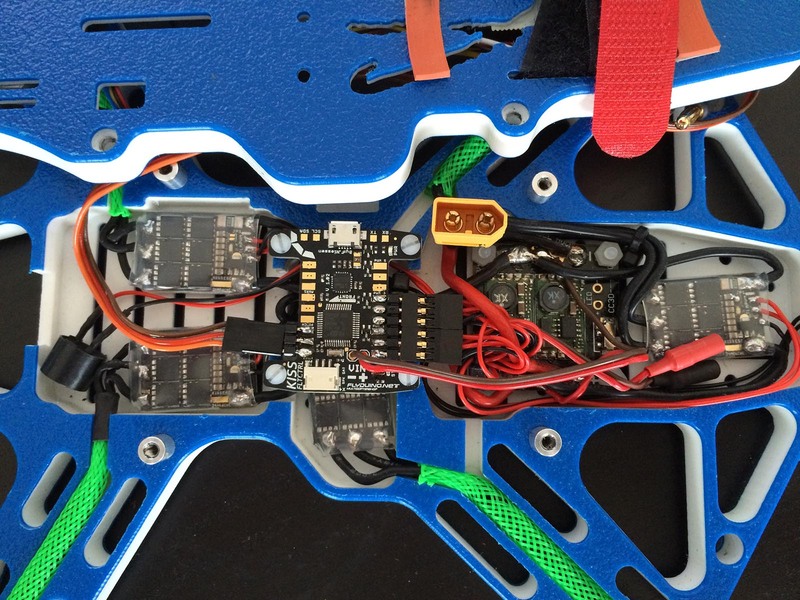 Also the KISS FC does have the ability to receive live telemetry data from supported ESCs. This means no more extra current sensor / voltage divider. The voltage is measured directly by the KISS FC itself. If connected to KISS 24A Race Edition ESCs you also get live current readings as well as RPMs from each motor! Of course, capacity consumption is monitored as well. Best part: Not only can the KISS FC read these values from the ESC, but it also enables direct output via different channels. 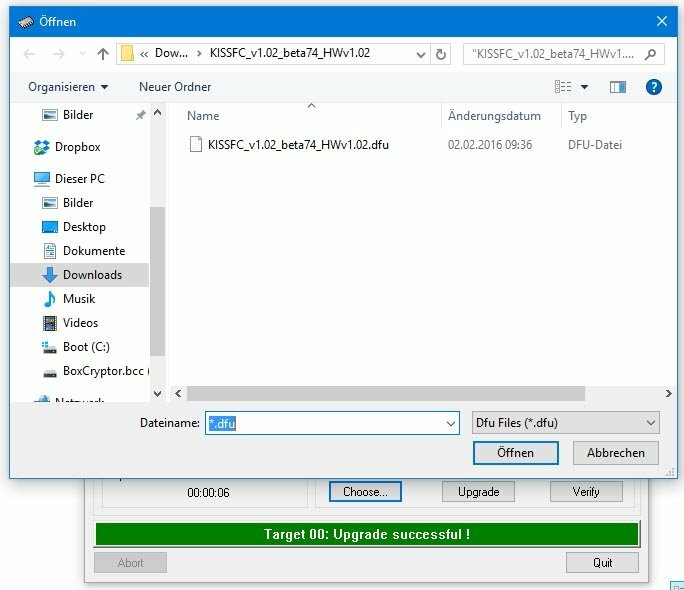 You can choose between displaying the data on your OSD* or send them directly to your transmitter via telemetry downlink. For the latter feature you can use FrSky* S-Port telemetry, Jeti ExBus, Graupner HOTT telemetry and MultiPlex telemetry. For us as Jeti users seeing EX-Bus on this list is exciting, as this rather expensive system (with a ton of possibilities) has been neglected by the drone world in the past – maybe due to little market saturation . The controller’s pdb is not square as you are used of other controllers, but has some kind of a H-shape. This is a big advantage in terms of space utilization. At least when you are plan on soldering connection headers to the controller to use servo connectors, instead of soldering the ESC’s cables directly to the KISS FC. The overall PDB design is well though through. On the front side you have all your channel inputs (top and bottom, three on each side) on the back you find your ESC outputs (again top and bottom, three on each side of the board). On the top side you also have the status LED, the main voltage input, the boot jumper (which has been replaced by a push button in Revision 1.03) as well as the microUSB-port, the serial connectors for OSD communication / bluetooth / VTX telemetry or controlling your FPV cam via UART. The back holds the 5V 500 mAh step down converter as well as pads vor CAN-BUS and a signal buzzer*. 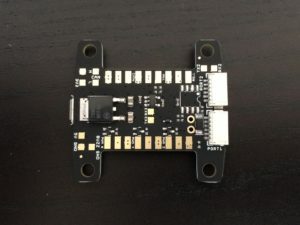 You also will find a dedicated output connector at the side, which can be used with the KISS ESC PDB. 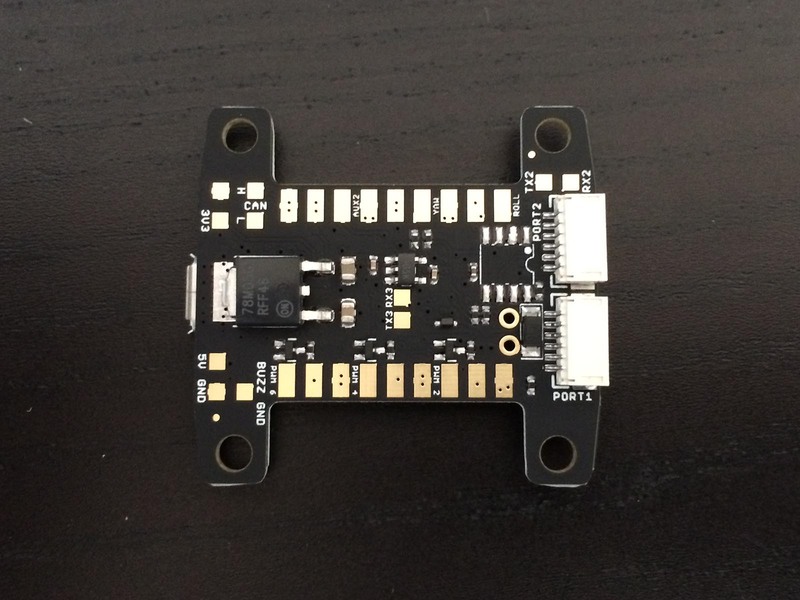 This way you solder the ESCs to the dedicated board and just have to connect one single, pre-assembled cable to connect all ESCs to the controller. That’s pure KISS. The KISS FC is connected via micro USB to any computer that is able to run Google Chrome web apps. On Windows (Win 7 and newer) the driver for the processor will be installed automatically and hassle free. Open up Chrome, go to the app tab, install the KISS FC GUI from the web store. It’s free. Once connected to the controller you have exactly two tabs to configure everything important. Start on the „Configuration“ tab (the one you are forwarded to when hitting connect). I assume that you DON’T have a battery pack connected or in case you do, you ALWAYS REMOVE YOUR PROPS FIRST! 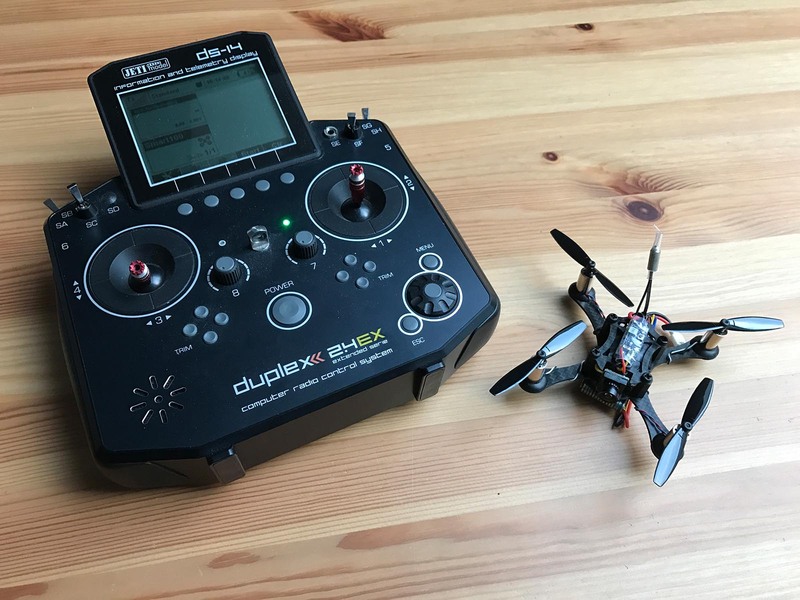 Put in your multirotor type and select the receiver protocol being used. 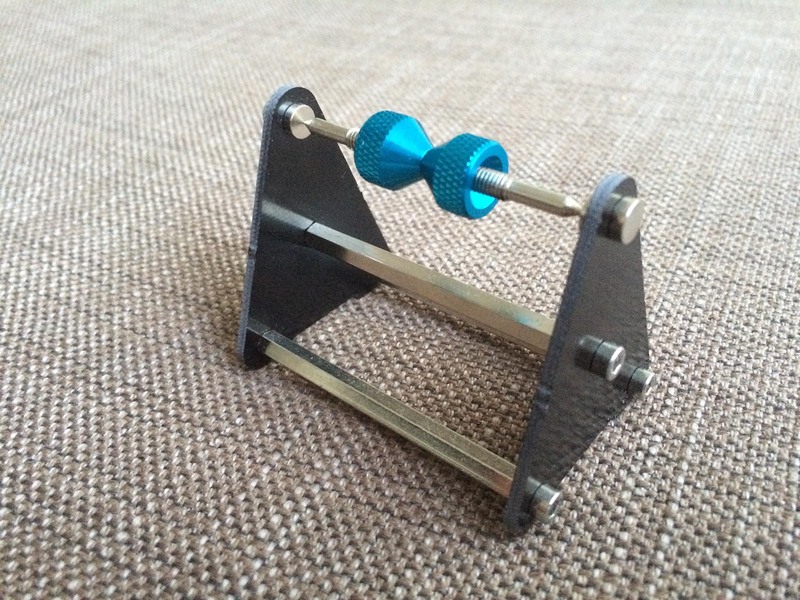 PIDs should be good enough for a maiden flight and can be refined later (if needed at all). As a security feature the controller will only save PID values, if no battery is connected! On the right side throttle values can be left untouched, for more details see the manual. Hit save and check the „Data Output“ tab. Move your transmitter sticks. You should see the input bars corresponding to your movements. Note which hardware switch is mapped to AUX1, AUX2 and so forth. Switch back to Configuration tab. Again on the right side set your arming switch, your mode switche and, if installed, your buzzer switch. Hit save. Disconnect. Go out and have fun. Of course, this is just a brief summary of how easy it is to get things going. You always should consult the manual, before you actually try to maiden your baby. I am using the KISS FC in combination with the KISS ESC 2-5S 24A race edition* and a Jeti RSAT2* receiver in ExBus-mode. This means the complete communication between receiver and controller as well as receiver and transmitter is fully digital. I don’t think that you notice the difference to analog PPM latency wise, but it’s comfortable, because telemetry and RC signal are sent through a single cable bidirectionally. This makes a very clean setup that even fits inside the Fossils Stuff Gravity 280 racer, which cannot be told to be especially roomy. You got to love tech! The flight performance is exceptional. This FC / ESC combo is so locked in, it’s hard to believe. It’s just something you have to experience yourself to understand, I guess. Even watching videos on YouTube doesn’t give you the real feeling of the performance this FC delivers. This is all in acro mode, of course. Level mode works, that’s all I have tested (it still can save you in some situations, so I didn’t want to neglect level mode completely). The KISS FC also supports 3D flying. I did not try this, yet. 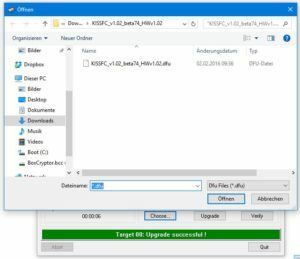 If you get a new revision 1.03 controller, you are lucky. First, you are most likely to have the latest firmware installed already and second, you have a handy push button instead of a boot jumper you will have to close with some solder and open it again after flashing. 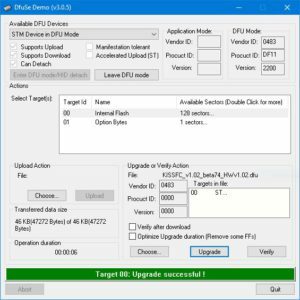 Upgrading the firmware is a ten step procedure, which should not be a problem for anyone, who has lived with Naze32 and co in the past. Still, upgrading the firmware is the only thing that opposes the KISS principal. In this case CleanFlight is way ahead of the KISS FC GUI. No plug and play on this matter for the KISS FC. 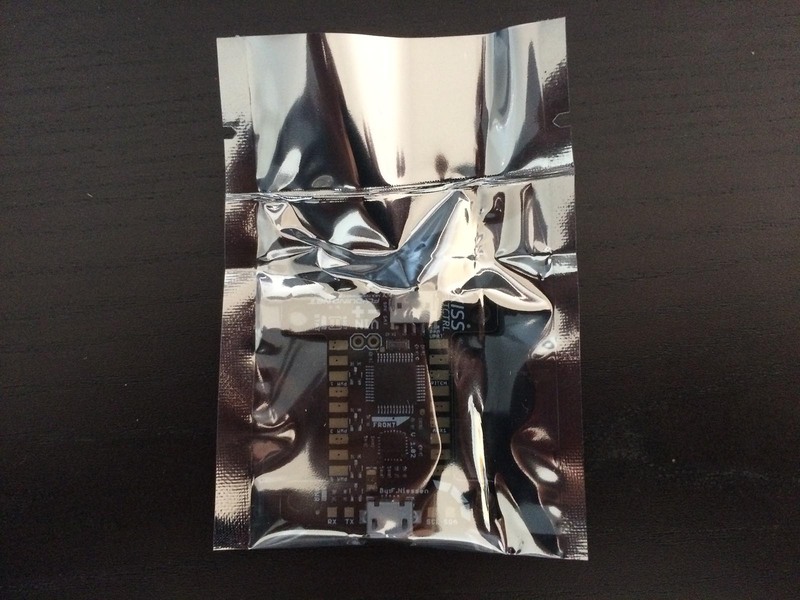 But if Flyduino did their homework right, we won’t have to see updates to often, I think. In the end the update process takes only a few minutes, if you do everything as described, tough. 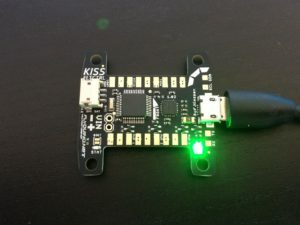 To stay up to date on the lastest developments in terms of KissFlight, you always can visit the Flyduino KISS website and have a look at the different release notes and beta versions to decide if you want to try out any of the new features coming up (be aware beta software is not stable!). 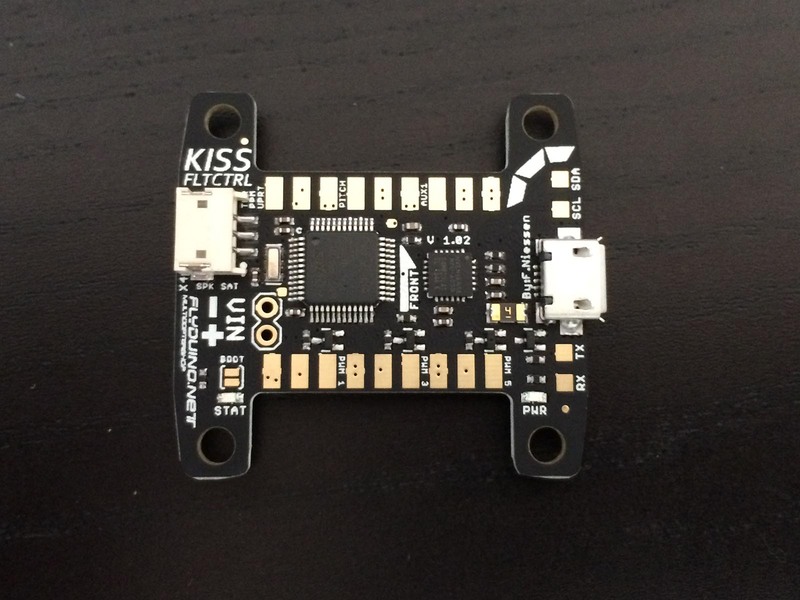 The experiences I made with the new KISS FC 32 Bit Flight Control* are very good. Configuration is really easy, the hardware design saves spaces and is well done. All port placements make sense. I love the telemetry support. It really works like a charm in combination with my Jeti DS-14 radio controller. Flight performance (together with KISS 24A RE ESCs) is exceptional! The price tag of under 35 € is a bargain for this flight controller. I personally would rather spent the money on a simple KISS FC than on a 10 DOF NAZE Rev. 6*. If your are going KISS all the way, there is hardly something more smooth on the market at the moment. Only downside is the annoying firmware upgrade procedure. A nice add-on to the KISS idea is the possibility to share your PIDs with other pilots or try theirs. That makes things a whole lot easier, if standard values aren’t for your setup. To be fair it has to be said, that the 24 A RE ESCs*, which are needed to use the full telemetry functionality, are quiet expensive compared to other ESCs. Nevertheless, you get what you pay for: Unbelievable in-flight performance. Jaw dropping performance to be precise and a bright smile on top! 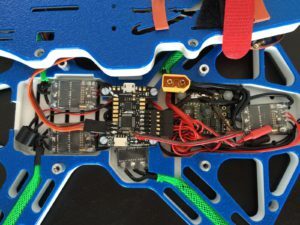 Not to forget the one-wire-telemetry to get telemetry data from all your ESCs plus the FC to your remote, which enables new possibilities in tracking your setup performance as well as allowing for a cleaner and lighter built. 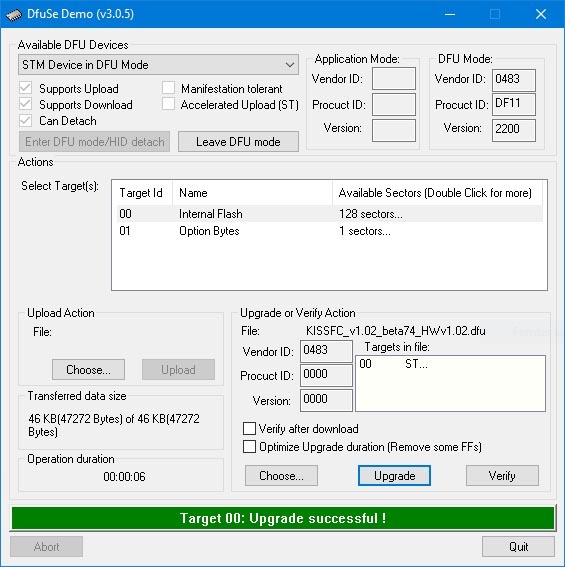 Looking for the right way to update your Flyduino 24A Race Edition ESCs through the new KISS GUI? Check out our guide with many helpful screen shots! 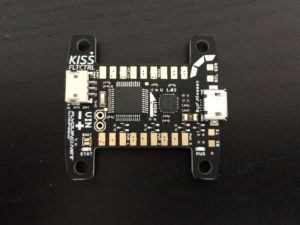 No more fiddling with each and every single ESC that needs new software: Just plug in your KISS FC and update all ESCs at once, without changing hardware connections.